Hey, okay. 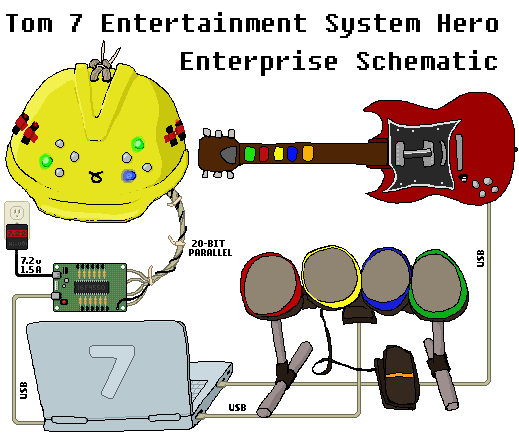 Finally I have the videos ready to reveal secret project 7H, which is called Tom 7 Entertainment System Hero. As usual, for best results click through to the HD version, or download the 1080p AVI from that page. This video has a bunch of clips in it, mostly from the Show at Belvedere's. You'll see a bunch of things. One is that I actually mess up a lot when playing. I'm better than this but two things contributed to my mistakes: (1) I was kinda drunk since the show started like 3.5 hours late and I got free beer for being a "musician" and (2) in the last week before the show I was sprinting to get all the software and hardware working, so I actually didn't practice hardly any of these songs more than the one time it took me to decide to put them in the setlist. Once it's available publicly I will challenge you to high-score battle to prove it. Hardware you ask? I didn't build the guitar or drums of course, but I did build the Laser Suspension Womb, which to be more pithy I sometimes call my "USB laser hat." It's a hardhat with a bunch of very bright LEDs and actual laser diodes embedded in it, powered by 1.5A, worn on the head, and connected to the computer via USB implemented on a custom circuit board with a PIC microcontroller. The in-game music and events ("drums were kidnapped!") trigger the lights and lasers to play along. I have a clever hack so that it doesn't need special drivers on any platform, though that's not helping penetration much because there's only one of them. This was my first real hardware project in my adult life, but now that I know how to do it I hope to do more (especially input devices, i.e., "instruments"). It's much better in 2009 than I recall from sticking paperclips and resistors in the parallel port in 1993. Rock Band drums are supported too. Unlike the guitar, which has a goal pattern for you to match, these are totally freeform. Commodore 64 samples are played in response to drumhits. I wish the controller supported some kind of velocity sensitivity, because that is kind of important for drum expressiveness, but too bad so sad. Techno details: The implementation is almost all in Standard ML using SDL, except for the low-level sound synthesis thread and the interface to the USB laser hat. That stuff's in C. It's easy to mix them. The code has some shortcuts in it for sure and deserves to be cleaned up (lots of them introduced in that last week sprint) but it also has some really nice parts, like the algorithm that matches your input to the score. The matching is ambiguous, so there's an on-line dynamic programming algorithm to be maximally generous to your playing. (I don't think Guitar Hero II had this maximally generous algorithm, which was one of the reasons I started working it out like a year and a half ago, but I do think that GH III and on do it right.) The finger patterns you're supposed to match with the guitar, which I call the "score", is generated automatically from MIDI files. To turn a T7ES MIDI file into a T7ES Hero game file, I have to assign instruments to each of the tracks, and then pick which tracks or track parts are supposed to be played on the guitar. The rest is automatic, save some tuning parameters. "genscore" has a model for how closely a candidate score matches the original MIDI (for example, if consecutive MIDI notes are rising in pitch, then it's better for the fingers to also be rising on the fretboard) and then it solves for the optimal assignment, measure-by-measure. I thought that I would need to modify the score after this to get good quality, but it actually works amazingly well. Some of the stuff it comes up with is super fun, like I would assume was created by a human with a good sense of fun. No. Only cyber-brain. I don't know if I'll ever get the opportunity to perform this again (befriend T7ES Band Page on Facebook for guaranteed notification), but maybe. Either way, I'm looking forward to sharing the software with you guys, which I will do as soon as I finish the auto-update and high score table, so that we can compete with each other and I can release song packs. As foretold by the bards, we played our show at Waffle Shop. This was awesome. It's a totally cool place. The folks running it were super friendly and helpful, like e.g. offering to brew me coffee and tossing us free shirts (seen above), and serving our custom waffle, the "Twix Ridiculous and The Sick Bisquickulous". Lots of people came out, sang along, and even people wandered in from the street, maybe on purpose. We unlocked an achievement: Our Facebook page now has 1 fan that is not already our friend. I don't know if it's related. 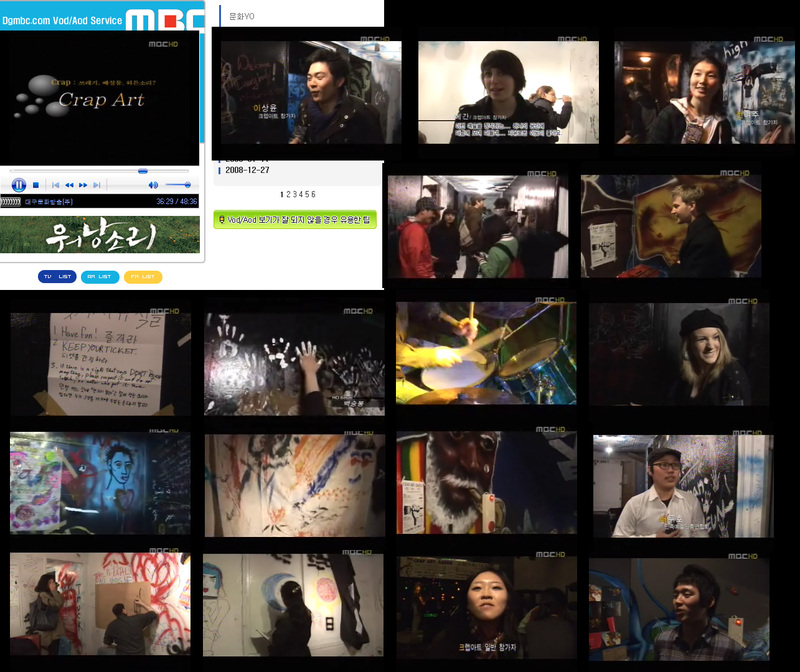 What you see above is Waffle Shop standard operating procedure, which is that they in addition to serving fresh, golden-crispy waffles, also film a reality show on the premises, which mainly means interviews with patrons but in our case interview with the musical guests. More lovely pictures on flickridiculous, courtesy Maja. There are some muy bueno pictures of us playing too, courtesy some dude née drxiv. Overall a great experience. I think Waffle Shop was happy too, like they kept our setlist to display in their tool shop / kitchen and seemed pretty impressed with the crowd volume. In fact if you go to waffleshop.org right now you will be greeted with manifold splendour. I dunno when video will be available, if ever. I hope eventually so you can see my dancing, which was very popular. We decided during the interview that the right way to describe it is "aggraceful." 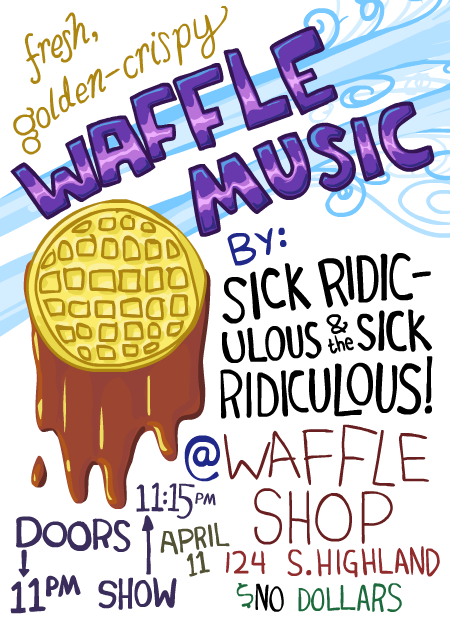 I recorded the show: Sick Ridiculous Live At Waffle Shop, in which you can hear us embarrassingly call the place "Waffle House" several times. Even more embarrassing is that the levels are way too high in the recording, though it gets a bit better once I turn my guitar down. Sorry for always blowing the MP3 version when I do line-in; I thought I was correcting for having this same problem last time by turning it to the lowest setting, but evidently I need more. We have two shows coming up. Art All Morning on the 26th in some warehouse in Lawrenceville will be some kind of acoustic oddity, but is at 10:30am. I am just telling you, not inviting you; 10:30am is a crazy time to go to or play a concert. Especially if you go to Cortney's birthday party at Gabe's house the night before, which we'll also be playing at! Expect new material and Febreezed classics. Fact: I did my Federal taxes like a month and a half ago, and saved my state and local for the last minute, giving me the worst of both worlds. It could be worse, though: this page has a 600 page PDF with all people and entities that are delinquent on their taxes, and some people are dozens of years late. Hey: Some of you locals may know about this place called Waffle Shop in East Liberty next to Shadow Lounge. It's a "real" waffle store in the sense that they serve waffles, but it's only open from 11pm to 2am two nights a week because it's also a CMU art project to create a reality TV show about local people's stories. Here's a story: my band Sick Ridiculous and the Sick Ridiculous will be playing there this Saturday night. The show is free. Since we're the only band and it's starting deep into the evening and it is pro bono we should have pretty good control over the start time, so I promise if you come you won't need to wait hours for the show to start. (We'll update the Facebook event and maybe here if the time estimate changes.) But moreover there are not just promises about not disappointing you but promises about 'appointing, e.g. : I got a new guitar which should increase our rock-sound without feedback quotient, which is also beautiful and has a rainbow strap and sounds a monster; this same night is a big WRCT dance party at Shadow Lounge and Ava next door so you can combine both activities into one wholesome well-rounded night on the town; we will be debuting our new song that I think is called School of Mines; and as resident musicians it is bandatory for us to invent a waffular concoction that will be available for purchase that night only. I can say for pretty sure that the waffle will be vegetarian and named after some contortion of our band's name; for example if it were composed of x86 and ALPHA microprocessors it might be called the "CISC Ridiculous and the Sick RISCdiculous", but optimally the named parts would not only be vegetarian but actually non-toxic food. Do you have suggestions? We have some ideas but we will absorb your ideas too if you deliver them to us by commenting. All submissions become property of Sick Incdiculous, LLC. (1) An okay paper about making programs faster with some dirty tricks. (2) The "LFMan" game and associated ephemera. If you have never seen the old TV Show "Square One" then you should watch this video of Mathman to understand the referent. It is a paper and talk and sort of an actual game: LFMan. (Use the arrow keys and '1' or '2' to select between SERVER OK and ABORT). The talk and demo went well even though I think there were a lot of people that are too young to have seen Square One. The award is itself an unplayable Arkanoid clone. This was playing on the screen during the awards presentation, and had just one dot left (you'll see it takes like 10 minutes for it to get that last one) for a long time, with people continuously going "awwwww" when the ball just barely missed the last dot. For the "people's choice award" we used the Clap-O-Meter to determine the favorite paper from a short list, but while we were using applause to determine that, the final dot was struck in the Arkanoid award, which was met with the clearly most enthusiastic cheering of the Clap-O-Meter phase. So the People's Choice award ended up being given for my own Award drawing, which I think we are pretty happy about the way that turned out. If you like this kind of thing, do check out the full proceedings. There's lots of good stuff in there. Long live SIGBOVIK!